Certainly you would agree that having healthy food choices in your kitchen is vital to keeping to your plan to eating healthy! Right? But, there is another strategy that plays an important part in creating that healthy game plan too: a well-organized and inviting kitchen! 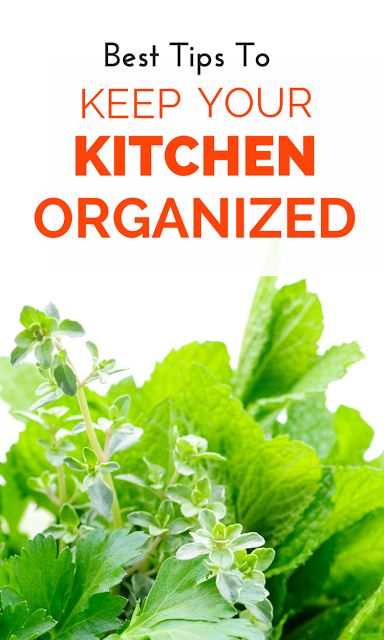 Yes, that organized space will help make preparing and eating your healthy meals and snacks much easier, a lot more enjoyable and successful, too! I am here to help you get there, and if your kitchen is already pretty darn close to being in health-promoting, tip-top shape and a place your family never wants to leave — Bravo! But, I will wager a guess that you may just pick up a new tip or two here that can elevate it even further. It’s such a worthwhile effort to spend a bit of time initially as well as the bit of time regularly to maintain an organized and inviting kitchen. With a thought-out cooking space, you will eat healthier, feel better, enjoy family meal-time more, look better and even save money and time. And, tell me, who doesn’t want more of that? Let those colorful, beautiful fresh fruits and vegetables that you shopped for be a beautiful design on your counter and let them be the first thing people see when they enter your kitchen. Take out that beautiful platter or cake stand and make a work of natural art! 2. Commit to a plan. Write your important meals for the week on a kitchen chalkboard so that all family members can see what goodies are coming. My family loves this and it always answered, “What’s for dinner tonight?” Make a space for the family to write comments or suggestions for future meal ideas, too. 3. Bring the out in. If you are lucky enough to have a sunny kitchen, an herb garden with your favorite and most used fresh herbs is a smart money-saving solution and looks so pretty. 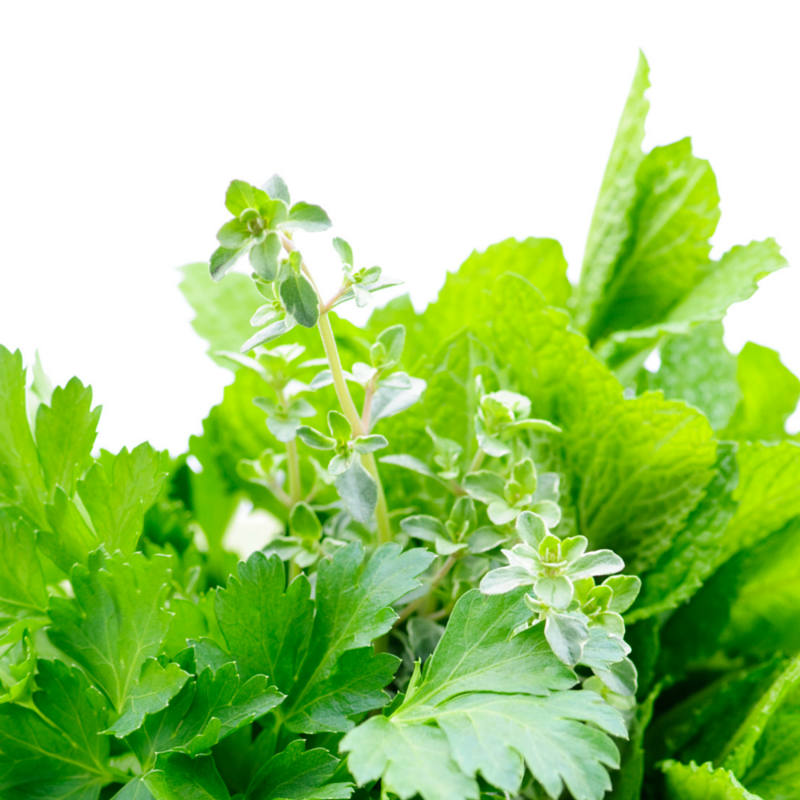 Fresh herbs allow you to cut back on the not so healthy stuff to make food taste good as well. Don’t miss this: Here is my number one tip to make all your food – every bite- taste superior! 4. Listen while you cook. Play favorite tunes while you cook and eat your meals. Invest in a good radio, docking station or speakers to enjoy your favorite podcast to learn something new or listen to a beautiful playlist while you dine. 5. Make them stay awhile. Make your kitchen welcoming with a clean, clutter-free space to dine with a comfortable chair to pull-up for just one more! But, why not create a comfortable spot for others to sit and talk to you about their day while you cook, too. A cozy chair in the corner or a great bar stool with a back can do the trick. Maybe, you take a turn in that seat and talk while others cook, too! Cooking requires a lot of standing, so wear your comfortable shoes while you cook or have a soft floor mat. Invest in a good apron to avoid ruining a favorite shirt, too. 7. Use lights to set the mood. Good bright lighting is essential to cooking to see what you are making. But, if you eat in your kitchen too, a dimmer on that light switch is a great and inexpensive upgrade to turn the lights a bit lower when you sit down and dine and relish in all your efforts and connect with others at meal time. A candle or two doesn’t just have to be for special occasions, either, so keep a few around to light up when the mood hits – even on an ordinary Monday night! So, for more of the practical side of things, keep scanning below for ideas of where all that kitchen stuff should go to encourage preparing those healthy meals and make that healthy eating work for you! 1. How often is it used? If it is a baking item and you only break out the bundt pan at holiday time, there is no need to keep it eye level in your cupboard taking up the valuable real estate. Those pans or other less used items should be placed higher where you only need to get your step ladder out twice a year to get them down. If that blender is used every day, though, the counter may be the best spot. 2. Who is using the item? Do your children use it and would it require them to climb to get this or, will you be constantly bending over to access it? You may want to think of the safest place to keep an item too. Knives with small inquisitive hands around might best be in a knife drawer, for example. Frequent healthy snack items may be better stored in a drawer where no one has to climb to reach them. 3. Is this item used frequently with another? Measuring spoons and measuring cups for example or lunch boxes with reusable storage containers pair well. Keep related items together. Sometimes a duplicate is reasonable. if not an inexpensive item. Two sets of measuring spoons at each end of the kitchen may be a good idea. 4. How and when is the item used? Planning, prepping, cooking, drinking, serving, baking, cleaning is all various kitchen actions. Consider storing like items together that you need for each action. If you have to go digging through several areas in your kitchen searching for all of the pieces to make the meal come together, chances are that you won’t do it or do it correctly and therefore those healthy pursuits won’t be quite so tasty! Think about creating zones in your kitchen. Here is what I mean: near where I store my flours and other baking items, I have within reach my measuring spoons and cups, mixer, and baking tins for example. Thus, this is my baking/prepping zone. No hunting around and the task is so much more enjoyable when everything is within reach! I also created an area where I keep my favorite recipes and cookbooks together as well and I created a box where I throw in magazine recipe tear-outs or ideas I jot down for future meals and dishes where I can get inspiration next time I am meal planning. If you often enjoy healthy smoothies as part of your breakfast plan but you tend to have busy mornings with little time to prep them, leave space in your refrigerator for the smoothie ingredients in one place. You can even directly place the blender pitcher in the fridge overnight and place the items you plan to blend in there ready to go (minus the wet ingredients) or create smoothie bags for the week with the pre-measured foods you plan to blend. The same idea can be used for snacks that you can pre-pack to quickly grab and go the next morning. Don’t miss this: Here are all the dos and don’ts on making those smoothies your best run. Familiar with the “first in, first out (FIFO) method?” It works well to eliminate waste. Here’s how it works: When filling the fridge with fresh food items, place all the older foods to the front and put the new ones in the back. For example, new apples go behind the older ones that I still have. Fresh almond milk goes behind the older carton. This method saves money and eliminates waste. Choose a day of the week to toss spoiled items. I do this on trash pick-up day so that spoiled food items don’t sit in my trash can either. Then, wipe shelves down right after as the refrigerator is less crowded then. Keep your refrigerator smelling fresh by wiping all surfaces, cleaning drawers, etc. thoroughly each month. 4. Keep need-to-use items at eye level. Place foods that will spoil over next few days or items that need to be eaten over next day or two on the eye-level shelf. This reminds everyone at your house to use them! It is a great reminder when cooking as well to use up those fresh herbs at dinner that night or your daughter may reach for that last bit of hummus to spread on her sandwich at lunchtime. Label your freezer items with a date made to ensure you don’t keep things around too long! Don’t miss this: Want a peek in my fridge? Please do! Clear containers (preferably glass or BPA-free) are great to get a quick glance when making your shopping list to see where you are getting low. The lids also keep items much fresher than bags as they seal air out. What is good for the refrigerator goes well here, too. Pardon me as I repeat myself: Here is how the storage method “first in, first out (FIFO) method works: when filling the pantry with food items, place all the older foods to the front and put the new ones in the back. For example, new boxes of tomatoes go behind the older ones that I still have. The new bag of lentils goes behind the older ones. This method saves money and eliminates waste. Don’t miss this: Here is a yummy way to use those lentils! 3. Schedule a reminder on your phone to toss. Reorganize pantry and toss expired foods every six months. This is so that when a recipe calls for an item that you think you have and then reach for it and realize it is expired, you don’t have to rush back out to the store to get what you need! Don’t miss this: Here are some other great productivity tools you may like. 4. Keep temptations hard to reach. Make getting that secret chocolate stash difficult and keep it out of sight and hard to reach. Organize the pantry so you don’t get the urge to fill that hunger with your occasional treats that you allow yourself. 5. Keep favorite meal ingredient items together. Have a healthy, family-favorite meal go-to or one you like to make regularly? Keep those pantry ingredients needed to make it together in a box or section of the pantry so that if under a time crunch and you need a quick meal to create, you will have it all there to make. Don’t miss this: Here is one great, easy healthy sauce that makes five great healthy meals! For even more great tips . . . follow my healthy home board on Pinterest (tap right here) that is chock-full of great pins to help you get your space looking great, naturally smelling clean as well as organized and clutter-free — all to best support your healthy lifestyle. Tell me, what are your secrets to creating a health-promoting kitchen space? Can you share them in the comments for better efforts to eat right? I had to drop a line again here, Lori, to let you know that your site looks fabulous. Congratulations on these awesome changes. Debbie – So sweet of you to take the time to tell me! Still working out the kinks but I am so, so pleased you like it! Again, thanks for your kindness and have a great weekend! What an awesome post! There are so many things I could do differently to make my kitchen more productive…will save these tips! Tara – how nice to hear! Thank you so much. 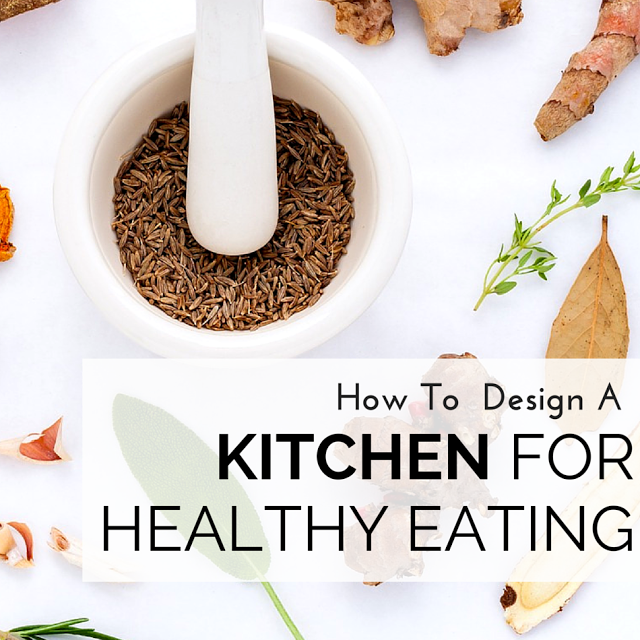 I do hope it helps you create that productive, healthy kitchen you seek. Welcome and so glad you came by. So great to hear that it clicked for you and you can look forward to sandwiches with lots of crunch! Thanks for taking the time to tell me. I always love to hear what readers find helpful. Awesome tips. I have a healthy eating kitchen that I'm going to implement a tip or 2 to. Thanks! Great news! Glad you found an idea or two here, Jill. Thanks so much for taking the time to comment! Definitely great tips! I tend to over buy and cook way too much and no one likes leftovers. That is my biggest struggle at the moment! That means a lot, Deborah! Thank you. Perhaps freeze some of those heathy leftovers or find a needy bachelor or bachelorette that hates to cook??! Thanks for adding in here! Yes, the beauty of nature always astounds, Nicole! Happy to hear you liked the ideas. Clean everything as you go – so important and one I need to work on, Debbie! I get creative in the kitchen and can make a mess! Thanks for the reminder! What a lot of good ideas for making a healthy comfortable kitchen. Thanks so much for saying so, Kathleen! Couldn't agree more and it does not take a fancy kitchen to do it, either! Good for you, Launna, and hope these tips helps you on Saturday!